We are very saddened to report the news that Little Joe died unexpectedly a few days. We have taken his loss hard and so it has been difficult to write this update. He was still just a baby. Little Joe just turned one year old in June. His short life was filled with medical hardship from almost the start, but we find some comfort in knowing that he was very happy living with his rabbit family---Scooter, Grace and Magenta. Rob and I essentially are the parents of all the bunnies here in our care. We love them, worry about them, clean up after them and grieve deeply when something happens to one of them. No matter how many bunnies come in and out of our lives, each rabbit is very special with their own unique personality and needs. And some even more so than others---which was the case with Little Joe. 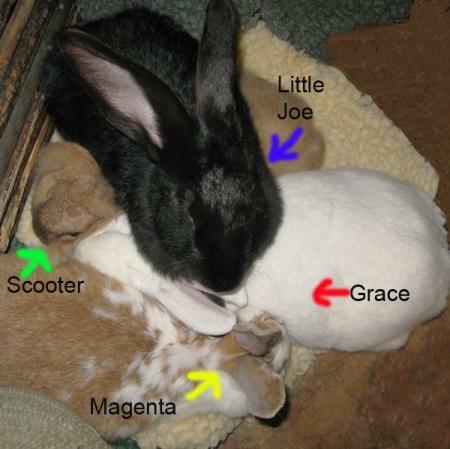 Within this bigger family are smaller families, like Little Joe's in which Scooter and Grace took on the roles of loving, protective parents to Magenta and Little Joe. They all took turns grooming one another and it was rare not to see them all snuggled together. When something frightened or concerned one of the group, Scooter first stepped in to calm everyone and investigate. Then Grace. This group LOVED Little Joe even more completely than did Rob or I. Little Joe went into distress very suddenly during exercise and was having difficulties breathing and swallowing. We tried mouth to mouth and rushed him to the vet. Over a period of several hours he grew colder and weaker and we were unable to save him despite CPR and heroic efforts by Dr. Michele Kim and her staff. We brought Little Joe's body home for Scooter, Grace and magenta to see and be able to have closure about where Little Joe had gone. When Rob put Little Joe's body in with his bunny family, Scooter first came over to see him. He nudged Little Joe, put his leg on the body and licked him on the lips. Grace was very upset and was trying to wake Little Joe up. It was heartbreaking. Scooter was comforting her and magenta. After a while everyone seemed to come to some level of understanding that Little Joe was gone. You could see and feel the sadness and anger in the group that Little Joe was gone. It took a few days for Scooter, Magenta and Grace to begin to act normal and at this point, they go on with their group snuggle, but without Little Joe. Goodbye Little Joe. What a brave and spirited little , big bunny you were. We all loved you very much. UPDATE 3/13/09---Little Joe Needs Help ASAP! WE NEED YOUR HELP! Little Joe is starting to splay on his front left leg. He is not able to support his weight with his other three legs and needs to see a rehabilitation specialist. Physically, Little Joe is recovering very well from his leg amputation surgery. We are also THRILLED to report that psychologically he has really turned the corner and is now a happy, playful young bunny who wants to be here. Here he is pictured with his bunny friends, Scooter, Magenta and Grace---all of whom are sanctuary rabbits at SaveABunny. They have helped him heal. As I wrote previously about Little Joe, he arrived at SaveABunny very depressed and in pain. His leg needed to be amputated and he had lived almost his entire short life unable to play and enjoy life like a real baby bunny. We decided to give him every chance to heal, but we also wanted him to have a good quality of life. To us that meant psychological and emotional healing in addition to his physical wounds. In addition to the best Western veterinary care we can get with Dr. Carolynn Harvey, we routinely employ complementary energy work and alternative healing modalities to help the bunnies heal at a very deep level. Physical healing is important, but to truly heal, deeper spiritual issues need to be tended to. My husband Rob and I are both Reiki Master teachers and we also have been trained in Shamanic techniques. We consult with a talented animal communicator, Cathy Currea (Malkin) and shamanic healer Sylvia Nachlinger. Little Joe was depressed and lonely. He is still just a baby, so I decided to try him in a group of special sanctuary bunnies we have and it was like magic. He is now living with Scooter, Grace and Magenta. Little Joe is a Flemish Giant adolescent boy who was born June 5, 2008. He came to SaveABunny through a progressive partnership with a Flemish Giant breeder who had rabbits in need of rescue or special care. For most of his short life, Little Joe has had a very painful, horrible infection and multiple abscesses on his left leg, which did not respond to treatment and medication at the breeder. This brave little boy is very underweight and is not thriving. We decided to take Little Joe to see if we could offer him any comfort or advanced medical care. His only other option is euthanasia, and if it is determined that we cannot help him and thus he is suffering, we will sadly have to make that choice. For now Little Joe received emergency surgery from Dr. Carolynn Harvey to amputate his leg. Our hope is that removing the leg will stave off a systemic infection and also give him the chance to learn to move without constant pain and the burden of a nonfunctional leg. Little Joe is very fragile and not available for adoption at this time. He is receiving special attention and care in our sanctuary area. It is possible that Little Joe may not make it, but we are doing everything possible to save him, give him a good quality of life and let him know that he is loved and treasured. If you would like to donate toward Little Joe's extensive medical bills that would really help us and him. Thank you for caring about this special little boy who wants to grow to be big and strong.